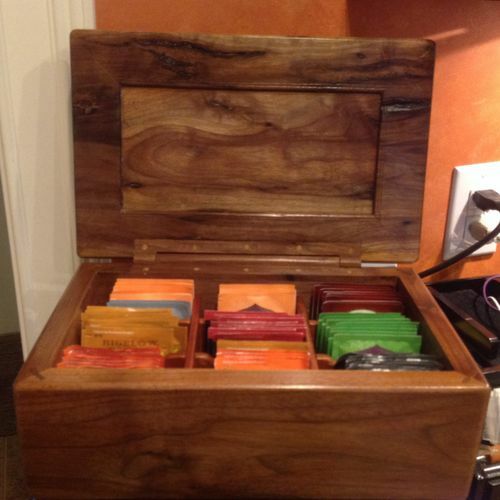 I built this teabox as a Christmas present for my wife. It is primarily walnut, purchased from a regional mill, with the exception of the bottom and the dividers which were made from wood that was here when we purchased the house a few years ago. As such I am unsure of the wood type. This project was my first attempt at making/ using a wood hinge. I’ve detailed the build on my blog if interested. The 4 rails making up the top are from one board in order to align the grain at the 45s as closely as possible. The finish is several coats of Amber shellac followed with 5 coats of paste wax. Nice work, great details and the hinge is cool as we’ll. Your wife will love it…... Nice detailed blog you posted throughout the build…..Beautiful work all around ! Well done ! kdc68….thanks, I believe she will. I appreciate your comments. I hope to someday get where I can work with the precision demonstrated on your unity boxes. I thought those were fantastic! I’ve realized that a router and router table, a “real” table saw and a work bench designed for wood working (with options for holding my work) will be helpful. Despite all that I am pleased with the end product and I really appreciate your words. -- Never underestimate the power of the history of sliced bread. Sliced bread is still the greatest thing since sliced bread. This is a real beauty. Nice work. Very nice box and the wooden hinge is always appreciated. This hinge is a new version to me. I like it. Thanks for the comments. The wooden hinge was fun to make. Integrating the stop was an afterthought once I went to HD and looked at the brass options. .... And my wife loves it. No more rummaging through boxes of tea in the pantry.